We’re on summer break, and that always leads to forgetting what we’ve learned. 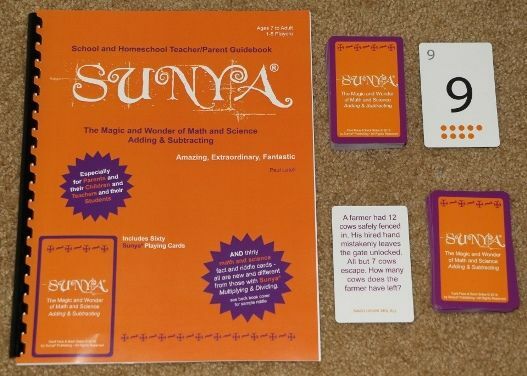 Sunya Publishing offered their brand new game Sunya – The Magic and Wonder of Math and Science Adding & Subtracting for review from the Old Schoolhouse Magazine’s Review Crew, and I have, for the last several weeks, watched my children keep their math and thinking skills fresh, painlessly and unknowingly! When Ruby, age 7, stared at the cards in her hand and after a moment suggested a move that even I didn’t see… score! The instructions were confusing – I’m still not sure we’re playing 100% right, but we’re practicing addition and subtraction and having fun in the process so I’m good with that. The instruction book is 25 pages and completely over even my 12 and 11 year old daughters comprehension. We finally just jumped in and went with it, and figured it out and sometimes made it up as we went. The game came with 60 quality cards including numbers and addition, subtraction, and equal symbols, a spiral bound instruction book, and 30 math and science riddle question cards. These riddles were my kids favorite part! The winner of the round gets to ask the others one of these questions. My kids have flipped through those cards time and again, to the point of memorization. I even caught Ruby sorting through them to pick her favorites. “Where do fish keep their money?” (At the river bank!) “How many apples can you put into an empty basket?” (Only one… then it’s no longer empty!) I’ve heard these and all the other questions over and over since the Sunya Publishing package arrived in the mail. Overall, I’m happy with the quality of the cards, and even the instruction book, with it’s glossy card stock cover – it’s not met destruction from the hands of many small children, ripped up like many of the sheet-of-paper game instructions in other games we own. That said, simpler, shorter instructions are something I hope for in the future. I love that all the kids could get involved and win – to the point that the first game they played together had my oldest coming in dead last. She was a good sport -and I was glad that it was a rather level playing field! This is brand new! It’s not even mass produced yet. 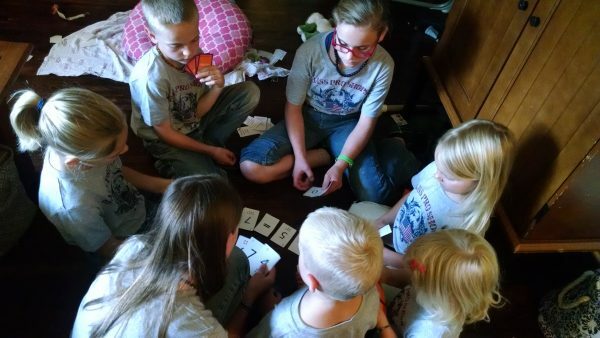 In the next few days, you should be able to order from their website and supplement your own homeschool with a fun game of learning together. The Crew reviewed both this and Sunya Publishing’s Multiplication and Division game as well. 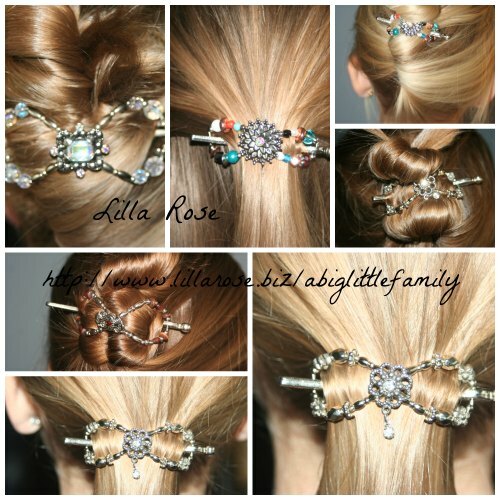 Check out what others thought at the Review Crew Blog!